Saints of God – Living, Dead, and …? The written version below is an expanded version of what was actually preached, and so includes material that is not in the audio. 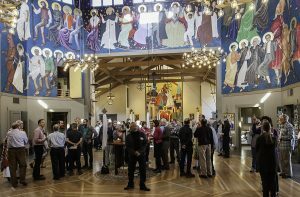 One of the most interesting church buildings I have ever visited is the St Gregory Nyssa Episcopal Church in San Francisco. I made a point of visiting it because so many Americans had said that my church sounded a bit like St Gregory Nyssa’s, although that had nothing to do with the building. 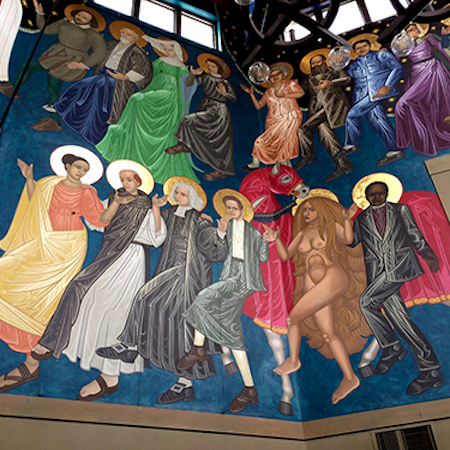 Perhaps the most striking feature of their church building is that high on the walls above the communion table, and all the way round, is a mural depicting various saints from many ages and many traditions. In keeping with St Gregory Nyssa’s playful approach to orthodoxy, there were all sorts of potentially controversial “unofficial” saints, including William Shakespeare, Mahatma Gandhi, and even Lady Godiva, clad only in her long flowing hair. 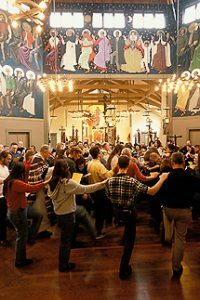 But the thing that really grabs your attention is that, although they are painted in conventional icon style, they are not separate icons but an integrated mural showing them each with a hand on the shoulder of the next, and all dancing, in step with one another encircling the room. During the Sunday liturgy, as the congregation moves from the liturgy of the Word to the liturgy of the Table, they join in the same dance, today’s saints and yesteryear’s saints, all in step with one another as they gather around the table of the Lord at the centre of the room. I want to reflect tonight on a couple of the questions raised by such a bold proclamation of the communion of saints. But I do so as a Baptist, which is a somewhat unusual perspective to discuss the communion of saints from, given that we have more often been known for our suspicion of anything to do with Mary and the saints. There is a temptation in ecumenical gatherings to downplay our differences and speak only of lowest common denominators, but it is my belief that that is why so much ecumenical endeavour has become boring and listless. It is much richer when we have the courage of our convictions and offer to one another our distinctive gifts, with both generosity and humility. That’s why, in this neighbourhood, we don’t use a bland hybrid liturgy for these ecumenical services, but share the riches of our usual styles with one another. So I come to this topic as a Baptist, although those of you who saw the icons in my church when we celebrated Epiphany together will be alert to the probability that I may not be as suspicious of celebrating the saints as some of my fellow Baptists have been. And there was an excellent book on the topic of the communion of saints written by three prominent British Baptist theologians just two years ago, so I’m indebted to it for much of what I have to say tonight. The most obvious thing that you would expect a Baptist to say when addressing this topic is that we have a more egalitarian approach to the saints than some branches of the Church. Like the eclectic approach seen at St Gregory Nyssa’s, we don’t have or wish to have an official system of canonising saints. Just as the New Testament uses the word “saints” to speak of all the baptised, we don’t observe a distinctions between All Saints Day and All Souls Day. We collapse them into one another and proclaim, in the words of tonight’s psalm, that “the Lord takes pleasure in all his people, adorning the humble with victory, and that this is glory for all his faithful ones.” So the saints include those sitting in these pews beside you tonight, as well as those remembered in the icons and windows that surround us. That much is obvious, and sufficiently biblical to not even be very controversial. Underlying it is something more, and it is not just a desire to downplay the importance of the saints of the past. Rather it is that Baptists have put a lot on emphasis on the idea of covenant. We believe that the church is not primarily constituted by an episcopal outreach into a local parish, nor by the voluntary association of some like-minded individuals, but by a covenant initiated by God. This understanding of covenant is multi-layered. It begins with God’s covenant with the whole earth. No one is excluded from the offer or the call of God’s covenant. It is a promise of life, and a self-offering by a God who takes flesh both in the earth itself and specifically in a human body. The covenant is enacted most explicitly as God and humanity become one in the living and dying body of Jesus, and we are all invited to be gathered into that body. We don’t become saints by being more extraordinary or more holy than other believers. We become saints by being gathered and baptised into the life and death of Jesus at the covenant invitation of God. As we heard from the letter to the Ephesians tonight, “In him you were marked with the seal of the promised Holy Spirit, the pledge of our inheritance toward redemption as God’s own people, to the praise of his glory.” All together, we are described as his Church, “the fullness of him who fills all in all.” What marks us out as saints then is what is special and unique about Jesus, shared with his whole body, not anything special that we accomplish as individuals. This does not mean that grand and courageous acts of faith are irrelevant. Even those Baptist churches that would never display icons or mention Saint Anyone in their prayers are likely to have honour boards on their walls and little plaques on their furnishings that recall the memory of those who have gone before them, and biographies of heroes of the faith have been popular devotional reading among us. But we still want to proclaim that the spectacularly godly quality of some lives arises as a grateful response to first being made a saint by the covenant of God. Many of the saints whose stories loom largest and inspire us the most would perhaps have been no more remarkable than you or me if they had lived in the contexts we live in. It is hard to resist an illustration from the local Feast of All Horses. The reason that Michelle Payne is, and will probably continue to be, one of Australia’s most beloved jockeys is not because she has achieved more than any other. It is because the stars lined up at the right moment for her, giving her the opportunity to shine publicly in a particularly bright and inspiring way. If Prince of Penzance had run fourth, Michelle Payne would still be the same impressive and inspiring person that she is, but we’d have probably never noticed. So too with many of our most beloved saints. Often it is the unique challenges of a particular time and place that call forth the most extraordinary expressions of covenant faithfulness in those who God has already claimed as saints. That said though, our readings tonight included the beatitudes and Jesus’s call to love our enemies and bless those who persecute us, not because they are the daunting preserve of a special few, but because they are the essential content of the covenant call to all of us. When a rising tide of nationalism demands that we should label desperate asylum seekers as national enemies and persecute them mercilessly, that covenant call may yet prove daunting and costly to any of us. There is another stumbling block that makes many Baptists uncomfortable talking about any sort of ongoing relationship with the saints of the past, and I suspect that when I describe it, you will realise that it is not so easily answered by other Christians either. It is the question of what sort of life we think the departed have after death, and whether our answers to that make talking of the communion of saints sound almost the same as some sort of occultist summoning up of the spirits of the dead. Many people, Christian and otherwise, hold on to the comforting image of death being nothing but a horizon over which people pass to an immediate continuation of a disembodied life in another dimension, usually called heaven. But although tonight’s readings didn’t address this, the more strongly attested view in the New Testament is that we die, body and soul, and stay dead until the day of resurrection when all will be raised. How is it then that both the Bible and the Church can assert that and at the same time continue to speak of an ongoing communion of saints? This question has real life practical implications as we face our own deaths or walk compassionately with those who are grieving the death of loved ones. And it comes up in very experiential ways at times. Many of us have had experiences in which it seemed that a loved one has become present to us from beyond the grave in a comforting or helpful or even challenging way. Like those images of Harry Potter being surrounded by a cloud of past relatives cheering him on as he faced down Voldemort, we have felt the presence of lost loved ones in moments of crisis and need. Do these experiences not point to an ongoing life in which they can both continue to pray for us, and sometimes even reach out to us like guardian angels? In order to find a satisfactory answer to this puzzle, I think we need to focus on this image of being “in” Christ, or “in” God, and how that might be different from merely being “with” God. For the popular image talks of going off to live “with” God after death, but the Bible talks more about us being gathered “into” God. How does that make a difference? Well what would you mean if you spoke of a loved one living on “in” you? You’d be talking about the power of living memories, wouldn’t you? You’d be describing how the memories of someone special go on living within you, at times seeming so tangible that it seems to make sense to talk of an ongoing relationship that guides and inspires your own living. Now, hold that thought for a moment while I remind you that when Jesus calls us to remember him at this table, that remembrance is something much deeper and more powerful than merely calling to mind a distant memory. The remembering that God does and that God calls us to participate in doesn’t just recall the dead, it holds their lives in trust. It is the power that raised Jesus from the dead. So if we can speak of someone living on in us as a memory, imagine how much bigger and more powerful and more alive that is when someone lives on in the memory of God. Over time, our memories fade, but those who are held living in the memory of God are held firmly for ever. Their love for us is remembered too, and their prayers for us, so that, living in the memory of God, they go on loving us and praying for us. Perhaps even those moments when we feel like we have encountered them again are the moments when our memories and God’s memories overlap for a moment and those who live on in both are experienced by us in the power of God’s remembering love. They are neither mere memories nor anything like ghosts. Their lives are held securely in trust, living on in the life-giving memory of God, as they and we await the day of resurrection. Now I hope that doesn’t sound too complicated and theoretical. I believe that it gives real substance to this idea of the communion of saints which otherwise might seem like little more than an obscure line in the home straight of the creed. I believe that as we grasp the meaning of the communion of saints, it has real implications for how we live and die as the Church of Jesus. I hope its implications are apparent for how we face our own deaths and for how we attend to the pastoral needs of those who are coming to terms with the loss of loved ones. It gives substance to our entrusting of the dying to the loving care of God without conjuring up unbiblical images of disembodied spirits floating around somewhere, even if that somewhere be heaven. Perhaps I might conclude with another implication that I think needs especially to be heard by my Baptist brothers and sisters. One of the strengths and the weaknesses of the Baptist tradition is our emphasis on the local dimension of the church. It is a strength when it stops us from expecting that the real business of the church belongs to someone more important somewhere else. But it is a weakness when it makes us preoccupied with our own local concerns and blinds us to the broader scope of the Church and the mission of God. The environmental movement often reminds us that we need to act locally but think globally. Baptists are often in danger of doing both locally, and we lose much of our effectiveness when we do. In a tradition that values the gathering of the whole congregation as the place where God’s leading is discerned and responded to, it is sometimes joked that “tradition” is that which prevents the dictatorship of those who have the privilege of still being alive to vote. When we, not only Baptists but all of us, grasp the reality of the communion of saints, we begin to grasp the breadth and diversity of the Church gathered into Christ, not only across the globe, but across the centuries. As we allow the saints who have gone before us to be held in our memories as well as in God’s, and we allow their voices to be remembered and heard as we seek to discern what God is calling us to now, we will not only be greatly enriched, but we will be far more effective ambassadors for Christ, and “with the eyes of our hearts enlightened, we will know what is the hope to which he has called us, what are the riches of his glorious inheritance among the saints.” Amen. Congratulations and thank you for a challenging and all encompassing message Nathan. You provided horses for all courses! 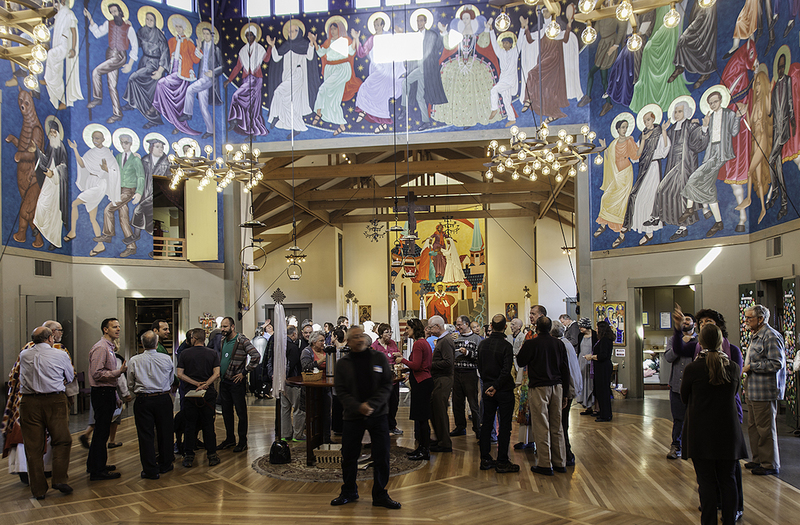 I notice how much the life of the church is driven by some of this content – we honour on our saints display rails a wide diversity of people – as well as our own past members. Further, the history of the church speaks to and informs – but does not control – our present day theology.